(a) Calculate the range of wavelengths for AM radio given its frequency range is 540 to 1600 kHz. (b) Do the same for the FM frequency range of 88.0 to 108 MHz. 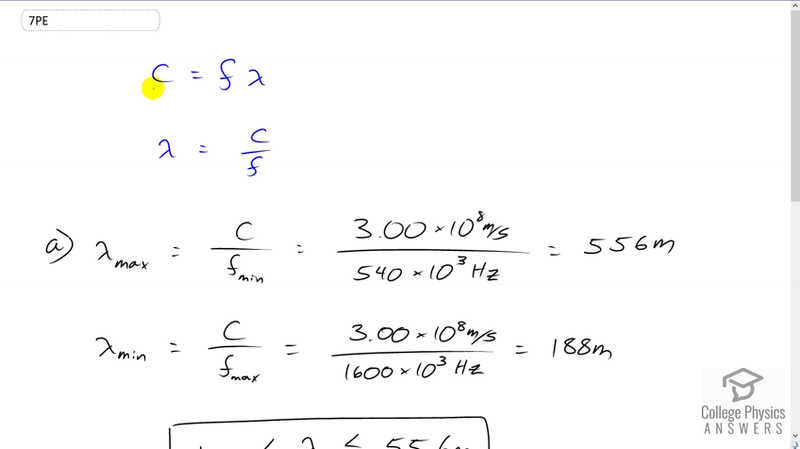 This is College Physics Answers with Shaun Dychko We're going to determine the range of possible wavelengths for the AM and the FM bands. So we have speed of light is the frequency of the light multiplied by its wavelength. And we can solve this for lambda by dividing both sides by f. So wavelength is speed of light divided by its frequency. And so for the AM band, the maximum possible wavelength will be the speed of light divided by the minimum frequency. So that's three times 10 to the eight meters per second, divided by 540 kilohertz. And that makes 556 meters. The minimum possible wavelength will be speed of light divided by the maximum frequency. So that's speed of light divided by 1600 kilohertz, which is 188 meters. And so, the wavelength for the AM band will be greater than or equal to 188 meters, but less than or equal to 556 meters. So it will be between these two numbers. Then for the FM band, we have the same formula, as in we're just dividing by the limits of frequency in the FM band. So for the maximum wavelength, we divide speed of light by the minimum frequency for FM, which is 88 megahertz, and that works out to 3.41 meters. And the minimum wavelength will be three times 10 to the eight meters divided by 108 megahertz. So the wavelength for FM will be somewhere between 2.78 meters and 3.41 meters.